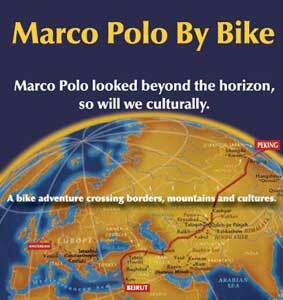 Cycling the trail of Marco Polo. It started as a dream and months later it became reality. The old Silk Route from the west to the east will be experienced again by five friends on their bikes. We have received some articles which have been published about our trip. 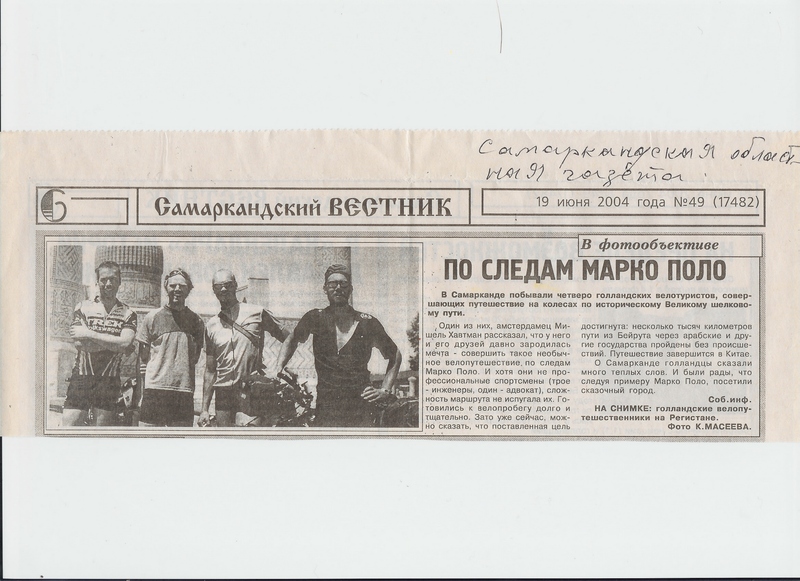 This is an article in the newspaper of Samarkant. And this is an article which was published in the Echo, an Amsterdam news paper. With Michiel and Edwin back in The Netherlands, check out here for a recap of our trip! Check out the latest pictures of Peak Lenin and China. And keep an eye out on the Telegraaf (Dutch newspaper), where soon an article will appear. New pictures were published, over 300, of Tajikistan (the Pamir Highway). Look under the Photos link. Check out the new stories of Iran and Turkmenistan, and Peak Lenin (this is in Dutch, sorry..), under the Journal page. Furthermore a new update was placed in the Spits two days ago, and in Op Pad (scroll down to the bottom). Today the missing pictures from Turkey and part of Iran have arrived!! These and the other pictures from Iran have been added to the site. And finally a journal for Lebanon and part of Syria has been put on our site! Have fun reading/surfing. Spits from 4th of May. Unfortunately the article of Tuesday 18th of May cannot be found in the online Spits. Furthermore two weeks ago, on Friday 14 May an article about our trip was published in the Telegraaf (page 5), a daily national Dutch newspaper. As soon as we have a soft copy of the article, this will be published on our site. So stay tuned for updates and thank you for your patience!!! We left 2 April at 6:55 in the morning, and currently we are in Turkey, on our way to Diarbakir. There have already been two updates in the Dutch newspaper Spits. See our latest column in the Spits, and our first column. Have a look at our Logo and watch out for it in the Media. Welcome to our site! We will update this section frequently with changes and news! Our contribute system is down at the moment. Please come back later for your contribution! Trek Bikes offered us 5 Trek 6700 for our journey! And on top of that we got Rigida to sponsor us with Sputnik rims. The bikestore Lohman in Amsterdam is assisting us in customizing these bikes for our adventure. Marco Polo by Bike in the media. Delta (article in weekly newspaper of the Delft University of Technology).